Specialty shops, sporting goods, designer wear and more! 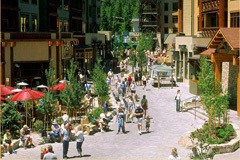 The Town of Mammoth Lakes offers a wide variety of shopping. From kid's stores to sporting goods to designer wear to furniture design studios. Don't forget the unique gift stores, specialty shops and beautiful galleries with resident and renown featured artists and photographers. Browse through the alphabetically, categorized list below. As it is a cursory list, you may wish to consult with one of our friendly agents for further recommendations or information at 800-325-8415 or 760-934-8372. Or, e-mail us when making your Reservation. You may also wish to print a copy of the list for quick reference while on your trip to Mammoth.